What are the benefits for Parents? Aligns communication with the fast-paced lifestyles of busy parents enabling around the clock access to view their child’s information (photos, stories and achievements) from a smartphone, computer or via email. Parents can receive news and information from educators all in the one place. Parents are notified of upcoming events & reminders fostering better participation in the daily curriculum/activities. Kindyhub enables parents to view photos of their child only plus any group photos sent by the centre. Helps ease the stress of Pick up and Drop off times for the working parent. Parents are able to collaborate and provide input to their child’s progress. Secure and Private, Username and Password required. How long does Kindyhub take to setup and how quickly can we get started? Kindyhub set up is fast and convenient. Register for our Free Trial by providing the requested details and we can have you set up within 48 hours. We recommend each group leader enters in their class list which should only take approx. 20 mins. What hardware or devices do you need or recommend to run Kindyhub? Kindyhub will run on any modern device….. We’re not device or hardware specific. Kindyhub runs on any desktop or mobile device, being neither device nor hardware specific. This includes laptops, tablets (Android, Apple and Windows), smart phones and iPod touches. All you need is a good internet connection and you’re away. Note: If purchasing an Android tablet make sure the device and its operating system allows multiple uploads. How can Kindyhub help services achieve an 'Exceeding' assessment rating? Will the children's photo & information be safe, secure & private? Kindyhub is Australian owned and operated, therefore compliant with the Australian laws. All data is stored in Australia. Security is at the forefront of our development and technical processes at all times. We perform internal reviews on a regular basis. Kindyhub goes the extra length to keep your data secure. SSL security giving additional peace of mind to parents/educators. We also have our own processes in place to keep top level administrator passwords strong and updated regularly. Photos only viewable when logged into the system through a protected login for Educators & Families. Data only ever available to relevant carers, managers and families. Who owns the information stored in Kindyhub? Each childcare service owns the content uploaded to Kindyhub. We simply store the information and enable them to share important information with families. Parent permission is recommended prior to using Kindyhub. 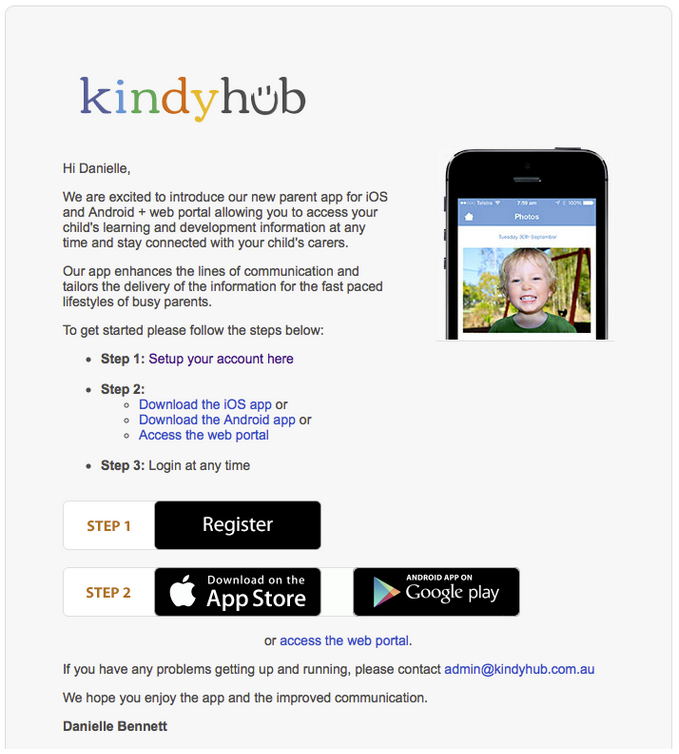 We have also included a Kindyhub Parent Flyer. This will provide parents with information on Kindyhub that can be sent out with the Parent Permission Form. What Pricing & Packages are available? Pricing is structured on a per child basis, keeping it very simple and affordable. We offer the choice of the Kindyhub Package or our Custom-branded Parent App Package. Learning – View daily reports & observations. What are the benefits of the Custom-branded Package and how does it differ? Essentially it is your very own app and giving your centre a marketing edge. Your logo features as the app icon, within the app itself and in the App store. Parents search for “Your Centres Name” rather than “Kindyhub”. A Family business directory within the Parent App. Gives centres an opportunity to offset some of the costs for Kindyhub. Parents within the centre group who wish to, can include their business in the directory available within the app. There is a set up fee of $99 per year per listing. $30 goes back to the centre. To add value for centre parents, we request that parent businesses include some kind of discount or offer to parents of the centre. Healthy Kids Feature: Promotes healthy eating , nutritious recipe ideas & health tips for parents. Get Active: Promoting active & healthy activities for children, instead of doing pocket drops. Many centres have asked us to have a section for this within the app. Interested centres must provide Kindyhub with this information for inclusion. Set up fees apply per listing. Help and Support are available in a number of ways. Tutorial Videos for easy access – these video’s can be located within the ‘Help Centre’ in Kindyhub enabling all users quick access. Feedback facility – we encourage you to use the feedback facility under Settings > Leave Feedback to provide information on any bugs, improvements you think may help, or any queries you may have. General response time up to 24 hours. If you’re unable to use the system for any reason, call us immediately and we will get onto it. We’d love to hear from you! We offer FREE webinars and online training. We can also provide in house training sessions if required depending on your location *charges apply. Do we have to back up data to a hard drive at the end of each year? We keep multiple backups of our systems in different locations so we’re always protected from data loss / disaster. You can keep a record of all reports & photos by exporting these from Kindyhub to a hard drive, but it is not necessary. How can we export data from Kindyhub if we don't wish to continue? You can export all reports & photos manually from Kindyhub at any time. We offer a 4 week free trial for one room within your service, available to any established early learning service. 4 weeks should give you enough time to explore the system and give an indication as to whether Kindyhub is the right fit. Most importantly it will provide you with feedback from your educators and families. The trial is best used in a real world scenario to gather information within the system and share it with the families via email. Your included families will receive information, news and reports sent from Kindyhub via email. Once you have made the decision to subscribe to Kindyhub, we can then arrange for your Parent App to be launched. All details must be completed in order to activate your account effectively. We appreciate your cooperation. What happens after the free trial has ended and we want to proceed? Which Package you wish to subscribe to; Kindyhub Parent App or Custom Branded Parent App? How many child profiles required for first month’s use? Once the information has been received, you will be issued with an invoice and the Kindyhub Client Agreement with Terms & Conditions for the use of Kindyhub. The subscription will need to be finalised within 7 days. Once completed we will continue with the full setup of your Kindyhub account. You will continue to have access to your trial account during this period. What are the benefits for Educators? Increased engagement and collaboration from parents and families, providing validation and an intangible reward for the hard work that goes into all the documentation. What makes Kindyhub different and Unique? We offer centres the ability to ‘Get noticed’ using their very own custom-branded parent app with additional features available. It’s a fantastic marketing tool and can be a self-funding option when combined with the business directory simulating local community involvement! The custom version also includes features for promoting a healthy lifestyle for our kids. Be sure to ask us for more information if this interests you. Kindyhub is secure web-based software enabling educators to simplify and streamline documentation and enhance communication with parents, in-turn improving children’s learning outcomes. Educators can quickly link to Early Learning Frameworks and Standards. We also enable flexibility to those centres who wish to customise links and add their own outcomes and philosophies. Our Parent App tailors communication to the fast paced lifestyles of busy parents allowing around the clock access to view their child’s information (photos, stories, & achievements) and supporting quick and easy two way communication (parent feedback, medical alerts, newsletters, reminders, events, menus etc). Parents gain deeper knowledge of how their child is developing and the opportunity for further involvement to expand on their child’s learning potential. What help and training is available to staff? All staff will have access to our Help Centre when logged into Kindyhub. Here they will find useful resources to gain comprehensive knowledge on each feature and function. Support: Contact the Support Team for assistance. Telephone or Submit Support Request. Available to staff, free of charge. Bookings are required. Group training sessions can be provided for a fee of $250+ GST per session, plus any travel/ accommodation expenses incurred. Each session will be 1.5 to 2 hours depending on the group size, within usual business hours. For larger groups of 20+ we would require 2 trainers to be present. If you require training services out of these time slots, then please contact us to discuss any alternative arrangements. *Additional fees may be incurred. Will the children's photos & information be safe, secure & private? I am a parent and I have forgotten my password to access the Parent App? You will need to get in touch with your Centre Director and ask them to resend you the ‘Parent App Invite’, so you can reset your password. I am a parent at a centre using Kindyhub, How do I access the Parent App & Web Portal? Contact your centre director and confirm they have your correct email address in the system. If you have not received a parent app invitation, the centre director will need to re-send the parent app invitation through your child’s profile page in Kindyhub. The centre director will arrange a Parent App launch date with Kindyhub and inform families of the date they can expect to receive the invitation to register for the Parent App. On the scheduled launch date, Kindyhub will send out a unique Parent App Invitation to all families from the centre’s main email account which will contain an invitation link unique to your child. 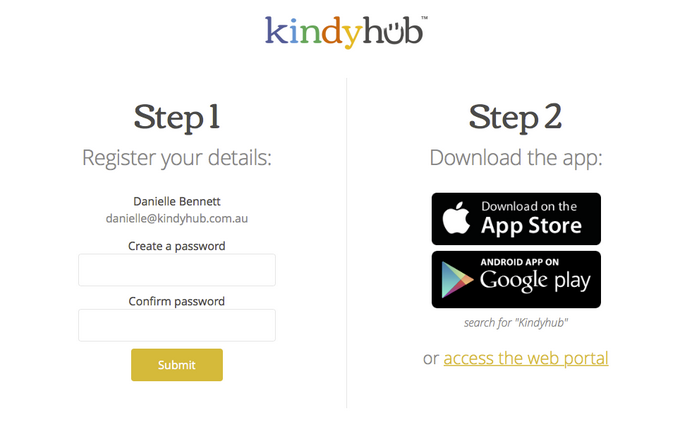 You will need to follow the steps to register and setup your Kindyhub account. From here, Centre directors will be able to manage any further app invites which need to be sent. iOS & Android smartphone versions will be released at the same time. Is my child's information private and secure? Kindyhub understands the significant importance of keeping your child’s information private and secure. Kindyhub’s security has a number of processes in place to keep your data safe. From a technical perspective, we utilise SSL technology to encrypt all data during transmission – this is the same technology used by banks, payment gateways, government departments and other recognised online networks such as facebook and Instagram to protect data. We run a number of security modules behind the scenes which monitor activity on our servers and block any potential risks of unlawful access. We also have a number of internal processes for limiting and maintaining access to sensitive areas of the system and run security audits regularly to ensure it’s always at the forefront of what we do. All passwords are encrypted. We have processes in place to keep top level administrator passwords strong and updated regularly. Stored information can only be viewed by the authorised carers, management and family members when logged into Kindyhub through protected logins. Who owns the information uploaded to Kindyhub? Your child’s childcare centre owns all content uploaded to Kindyhub. We simply store the information and enable them to share important information with you.